Mr Highcock has a specialist interest in the surgical management of knee pain and knee arthritis. He was the First Biennial Allan Gross Adult Reconstruction International Fellow at the world-renowned Mount Sinai Hospital, Toronto, with Dr Allan Gross and Dr David Backstein. He is a Fellowship trained surgeon in Osteochondral Allograft Surgery, Joint Preservation Surgery, Partial Knee Replacement, Total Knee Replacement (including Medial Pivot Knee Replacement surgery) and Revision Total Knee Replacement. Mr Highcock practices the most modern surgical techniques in knee arthroplasty surgery and enhanced recovery, allowing his patients to return to normal life as soon as possible. The major types of arthritis that affect the knee are osteoarthritis, rheumatoid arthritis and post-traumatic arthritis. Osteoarthritis is the most common arthritis of the knee. It is a degenerative (wear-and-tear) arthritis that occurs most often in people over 50 years of age, but can occur in younger people. In osteoarthritis, the cartilage in the knee joint gradually wears away. As the cartilage wears away, the protective space between the bones decreases. This can result in bone rubbing on bone and produce pain. Rheumatoid arthritis is a chronic autoimmune disease that affects multiple joints, including the knee joint. It is typically symmetrical, affecting the same joint on both sides of the body. In rheumatoid arthritis the membrane that covers the knee joint is inflamed resulting in pain, stiffness and deformity. Post-traumatic arthritis develops after a severe injury to the knee. Examples include fractures around the knee, meniscal tears and ligament injuries which can cause deformity or instability, which over time can result in arthritis. A knee joint affected by arthritis may be painful, stiff, swollen or deformed. Generally, the pain develops gradually over time, although sudden onset pain can occur – often after a minor injury. Additionally, the joint may become stiff and swollen, making it difficult to bend and straighten the knee. Weight bearing activity may cause pain to worsen. Loose fragments of cartilage can interfere with the smooth motion of joints. The knee may ‘lock’ or ‘stick’ during movement. It may creak, click, snap or make a grinding noise (crepitus). Many people with arthritis note increased joint pain with cold weather. Early knee arthritis may be amenable to joint preservation surgery with an osteotomy. This may be a High Tibial Osteotomy (HTO) or Distal Varus Femoral Osteotomy (DVFO). Mr Highcock is Fellowship trained in both procedures. The aim of joint preservation surgery is to transfer weight from the arthritic part of the knee to a healthier area, to correct poor knee alignment, to prolong the life span of the knee joint and avoid knee replacement in young active patients. By preserving the patient’s own knee anatomy, a successful osteotomy may delay the need for a joint replacement for several years. Furthermore, is that there are no restrictions on physical activities after an osteotomy—you will be able to participate in your favorite activities, even high-impact exercise, or a physically demanding job. Knee osteotomy is most effective for active patients who are less than 60 years old. The majority of patients go home 1 or 2 days after an osteotomy. After the operation, patients will most likely need to use crutches for 6-12 weeks. A knee brace is also used to protect the knee. Full weight bearing usually begins at 2-6 weeks after surgery. Rehabilitation with a physiotherapist is important for full recovery. Rehabilitation exercises help maintain range of motion in the knee and restore strength after surgery. Patients are usually able to resume full activities 3 to 6 months after surgery. For most patients, osteotomy is successful in relieving pain and delaying the progression of arthritis in the knee. It can allow a younger patient to lead a more active lifestyle for many years. Even though many patients will ultimately require a total knee replacement, an osteotomy can be an effective way to buy time until a replacement is required. Mr Highcock has a specialist interest in Total Knee Replacement (TKR). He trained in all aspects of TKR at Wrightington, Liverpool, Sheffield and Toronto, Canada. Alongside tradition TKR procedures, he is the only Orthopaedic surgeon currently offering a medial pivot design philosophy in the Northwest of England (a technique learned in Toronto). Mr Highcock runs an enhanced recovery program for most of his knee replacement patients. Patients who are suitable (co-existing medical conditions dependent) are bending their new knee fully and walking the same day of their surgery. He does not use drains, or heavy dressings, which can delay rehabilitation. All patients have local anaesthetic to help with early pain management. Patients are usually discharged after 3-4 days. After the operation patients will most likely need to use crutches for 2-6 weeks. Rehabilitation with a physiotherapist is important for full recovery. Rehabilitation exercises are begun on the day of surgery and help maintain range of motion in the knee and restore strength. Patients usually resume full activities 6-12 weeks after surgery. The Medial Pivot Knee Replacement is a modern design philosophy in knee replacement surgery that increases stability in a knee replacement, and more accurately reproduces the movements of the normal knee. By replicating the bending, rotating and twisting of a healthy knee, recovery and satisfaction with the knee replacement is higher, and patient report better functional outcomes than other knee replacement designs. As patients report better stability and better bending, patients are more likely to ‘forget’ they’ve had their knee replaced. A patient information page explaining the evidence for improved satisfaction, quadriceps function, knee implant survival and design philosophy in more detail is available here. Mr Highcock is not responsible for the content of external sites. See external linking policy here. Mr Highcock runs an enhanced recovery program for all of his medial pivot knee replacement patients. Patients who are suitable (co-existing medical conditions dependent) are bending their new knee fully and walking the same day of their surgery. He does not use drains, or heavy dressings, which can delay rehabilitation. All patients have local anaesthetic to help with early pain management. Patients are usually discharged after 2 days. The Medial Pivot design knee replacement has the added benefit of requiring less functional demand on the quadriceps (thigh) muscle, aiding recovery after surgery. More information is available here. After the operation patients will most likely need to use crutches for 2-4 weeks. Patients are usually able to resume full activities 6 weeks after surgery. 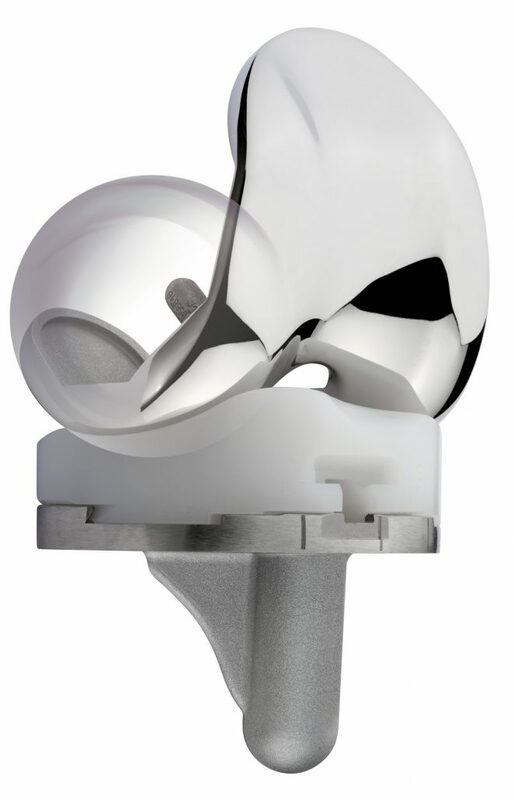 Mr Highcock is Fellowship trained in Medial Pivot Knee Replacement and subscribes to the design philosophy. There is evidence that these knee replacements have increased ‘forgotten joint’ scores, higher satisfaction, increased early bend, improved stability and good long term implant survival. For more details on enhanced results see here. Mr Highcock has a specialist interest in Unicompartmental Knee Replacement (UKR) surgery. He trained in all aspects of UKR at Wrightington, Liverpool and on Fellowship in Toronto, Canada. UKR is a surgical option were only one half of the knee has become arthritic. It is a smaller surgical procedure than a total knee replacement with faster recovery. Mr Highcock runs an enhanced recovery program for all of his knee unicompartmental replacement patients. Patients who are suitable (co-existing medical conditions dependent) are bending their new half knee fully and walking the same day of their surgery. He does not use drains, or heavy dressings, which can delay rehabilitation. All patients have local anaesthetic to help with early pain management. Patients are usually discharged after 1-2 days. After the operation, patients will most likely need to use crutches for 2-4 weeks. Mr Highcock has a sub-specialist interest in Revision Total Knee Replacement. He trained in revision surgery at Wrightington Hospital and had Fellowship training in revision surgery at both the Cavendish Fellowship in Sheffield and the world-renowned Mount Sinai Hospital in Toronto with Dr Allan Gross and Dr David Backstein. Mr Highcock deals with all aspects of knee revision surgery and is trained in modern techniques for infection eradication, bone restoration, trabecular metal reconstruction, and joint reconstruction.